F.W. Derbyshire Inc. has been manufacturing Instrument lathes for small and micro parts Since 1911. Our lathes have been used for extremely accurate parts manufacturing. First to manufacture watch and precision geared assemblies like dial indicators , then on to aerospace components , medical products and more. In 1916 F.W. 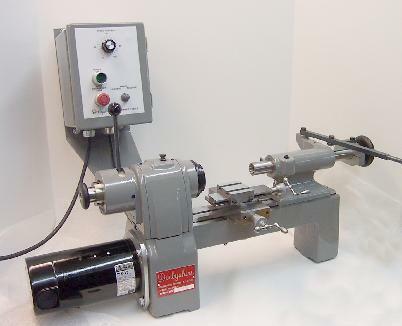 Derbyshire was granted a patent on the rack & pinion collet holding tailstock ,this design would become the standard for manual small hole drilling on Instrument lathes. In 1950 the smallest hole (at that point in time ) ever drilled in metal was drilled on a manual Derbyshire lathe .0006" ( 6 ten thousands of an inch) . Our Webster/ Whitcomb (W/W) collets and our Magnus/ Elect collets ( also refered to as D or Derbyshire style) are known by millions. In 1987 we introduced our first CNC lathe a Gang tooled unit with Interchangeable Top Tool Plates , the first of this concept. If your requirement is for accurate small parts research, development or product manufacture you CAN NOT find a Better Lathe.